This easy, nutritionally balanced recipe is perfect for a simple supper or lunch. 1. Spread the jerk paste over both sides of the chicken breasts, then place on a lightly oiled baking sheet and leave to marinate for 10 minutes. Heat the grill to medium hot and grill the chicken for 15 minutes or until cooked through, turning once halfway through. 2. In the meantime, pour the coconut milk and 250ml boiling water into a pan. Add the rice, bring to a simmer, then cover with a lid and cook for 20 minutes. Top up with more water if required. 3. Add the kidney beans and cook for 5 minutes or until the rice is tender. 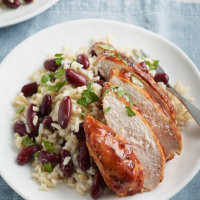 Serve the chicken, thickly sliced, with the coconut rice and garnish with the coriander. Wrap any leftover chicken in a chapatti or flour tortilla with some iceberg lettuce and a spoonful of yogurt for a delicious packed lunch.